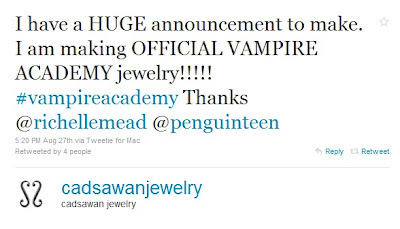 We got some exciting news today about new Vampire Academy jewelry! 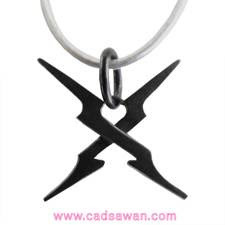 Most of you already know that Psynde makes official Vampire Academy jewelry, which you can still buy in her Etsy shop. So far we have the Molnija mark as a charm necklace, available in oxidized brass. And we also have Promise mark earrings (studs). 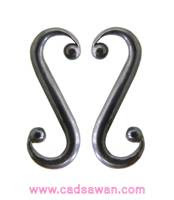 They are 1.25 in long and will be available in oxidized sterling silver and white brass. While it can never substitute narrative, it can represent the one thing in a story that actually gives it soul – a character, a place, a message. And, this is exactly why jewelry and books go together so well - one explains the other encapsulates. When I approached Penguin to develop a collection for Vampire Academy, I had already developed lines for three vampire universes, but what urged me to pursue this collection was the underlying message of the books: love – love in friendship, relationships, patriotism, tradition, and of course, the supernatural. So much soul in one story can only make great jewelry! Until September 30th Cadsawan Jewelry are also offering a 10% discount to the readers of Bitten by Books. Visit them to find out more! It’s the pieces that embody meaning either through symbolism, stories, legends, or epics that really makes my heart beat faster.It makes me feel like I’m an alchemist translating words, characters and meaning into a different form. The blog post includes a giveaway that is actually open for a few more hours! New York, N.Y.– September 15, 2010 – The uniqueness of Vampire Academy by Richelle Mead lies in its mythology and message. The essence of the book is about love in many forms – friendship, relationships, patriotism, tradition, and of course, the supernatural. Janet Cadsawan creates jewelry based on ideas and myths, and given her love of vampires, Vampire Academy was the perfect narrative for Cadsawan to fashion into a jewelry collection. Mead is known for incorporating magic, religious and mythical elements to her books, and in Vampire Academy, she makes them tangible through tattoos, talismans and jewelry. This collection by Cadsawan embodies the revered symbols of the vampires (Moroi) and protectors (Dhampir) that have come to hold their own special meaning for fans of this book. Cadsawan has deftly created pieces that readers will want to wear to keep the story and characters alive. The Vampire Academy Collection includes pendants, charms, bracelets and earrings made from recycled metals. It is based on descriptions, concepts and characters in Richelle Mead’s Vampire Academy. The collection will be available for purchase on September 24th, 2010 at http://cadsawan.com/collection-buy.shtml. Vampire Academy, published by Razorbill, an imprint of Penguin Young Readers Group, is a #1 international bestselling series, with over 3.5 million copies in print in the U.S. and foreign rights sold into 32 countries. Two races of vampires walk our world. One, the Moroi, are alive and wield elemental magical. The other, the Strigoi, are undead and evil--feeding on the innocent to survive. Janet Cadsawan’s philosophy is that jewelry is magic-adorned. She designs one-of-a-kind talismans, fine jewelry and supernatural baubles. Her pieces are showcased in both art galleries and fine jewelry stores. She has had pieces appear on HBO's True Blood and has also designed pieces for Rachel Caine's Morganville Vampires. She uses local craftsmen to create her jewelry and only uses recycled metal for her collections. She is a lover of small and large animals, and lives on a farm in Greenwich, CT.